Using a melon baller or small spoon, scoop the seeds out of the cucumber slices, leaving about 1/4″ on the bottom to make them into little cups. Once they have all been scooped, squeeze the water from the cucumber pulp you have scooped out, and finely chop it. In a small mixing bowl, combine the drained tuna, finely chopped cucumber pulp, mayo and pepper. Stir to combine. Taste to see if you want to add more mayo or pepper. If your cucumber cups have a lot of moisture, dab away the water using a paper towel. 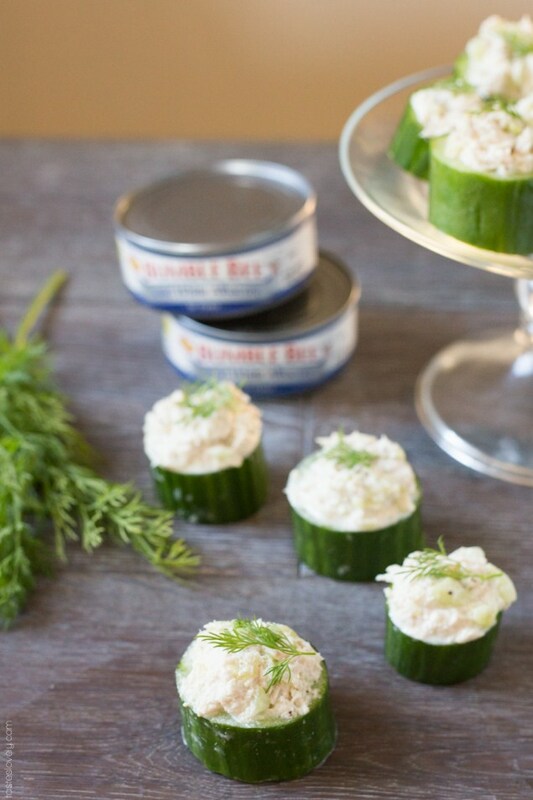 Then fill each cucumber cup with tuna, and garnish with dill.